When measuring and managing credit risk, It is important to have a clear understanding of common terms such as expected loss and unexpected loss. As stated in Credit Risk Assessment, credit risk is defined as “the potential that a bank borrower or counterparty will fail to meet its obligations in accordance with agreed terms.” This article will explain the calculations for expected loss (EL) and unexpected loss (UL), for both an individual asset and for a portfolio. Additionally, risk contribution (RC) will be defined. Probability of Default (PD) – is the likelihood that a loan will not be repaid and will fall into default. It must be calculated for each borrower. The credit history of the borrower and the nature of the investment must be taken into consideration when calculating PD. External ratings agencies such as Standard & Poors or Moody’s may be used to get a PD; however, banks can also use internal rating methods. PD can range from 0% to 100%. If a borrower has 15% PD it is considered a less risky company vs. a company with a 30% PD. Recovery Rate (RR) – the proportion of a bad debt that can be recovered. Expected Loss (EL) – referring back to Expected Loss Calculation, EL is the loss that can be incurred as a result of lending to a company that may default. It is the average loss in value over a specified period. 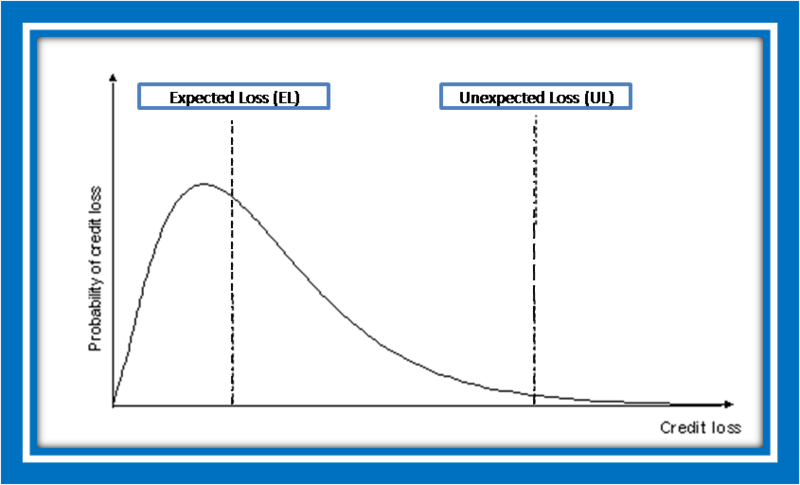 Unexpected Loss (UL) – it is known as the variation in expected loss. UL is typically larger than EL but they are both equal to zero when PD is zero. Note: The UL of the portfolio will be less than the sum of the ULs for the individual assets due to diversification benefits. If we take the sum of RCi + RCj we will get the same value as the unexpected loss on the portfolio. Correlation (ρ) plays an important role in measuring the potential UL in the portfolio. If correlation between the assets increases, the potential UL will increase.